Understanding the views and expectations of our stakeholders plays a crucial role in the success of our company and the acceptability of our operations. In order to identify in what topics we should particularly focus on in our sustainability efforts, we conduct a materiality assessment once every two years by engaging our key stakeholders. The most recent assessment was conducted with 161 stakeholder representatives in spring 2018. It identified 9 material topics that create the frame of our sustainability agenda. The materiality matrix describes these key sustainability topics from the point of view of our business operations and stakeholders. See our updated materiality matrix below. The material topics presented in the matrix have remained largely the same as in previous years. However, the scope of the materiality assessment was redefined in order to follow the GRI Standards Guidelines more closely. The most material topics for Neste were identified based on their relevance to Neste’s business, stakeholders, and estimated magnitude of impacts on society. The assessment clarified our view of needing to continue to invest in the development of new renewable products, management and transparency of the company's supply chains, and safety and incident-free operation. Interviews and a stakeholder survey of external and internal stakeholders were used in the materiality assessment to identify the most material topics. These issues were further elaborated in internal workshops and steering group meetings. Input and feedback were gathered also from Neste’s management and other relevant experts. Topics identified as material in the 2016 materiality assessment were included in the assessment. The most commonly mentioned new sustainability topic was circular economy. However, it was only mentioned by less than 10% of the stakeholder representatives and, therefore, not included in the materiality matrix. Circularity remains important for Neste as it is linked with our raw material usage. Altogether 161 responses were received from internal (29%) and external (71%) stakeholders via interviews and a web-based survey available to all stakeholders. We selected 28 (17%) representatives of our key stakeholders to be interviewed. 83% of the responses were collected through the survey. Stakeholders participating in the interviews and survey were from Finland (66%), North America (14%), Europe (10%), Scandinavia (4%), Asia (3%), Russia (1%), and other countries (2%). Respondents represented more than ten stakeholder groups. All key stakeholder groups were engaged. The largest respondent groups were customers and consumers (27%), Neste personnel (22%), analysts and shareholders (13%), suppliers of goods, services and raw materials (9%) and non-governmental organizations (NGO) (6%). Equally as many analysts/shareholders and NGO’s were interviewed. Together they accounted for 43% of the interviewees. Interviewees and survey participants rated nearly all topics similarly. The only exception was the topic Fair and equal employment, which survey participants considered more important than the interviewees. These internal and external stakeholder views are presented on the y axis of the materiality matrix. 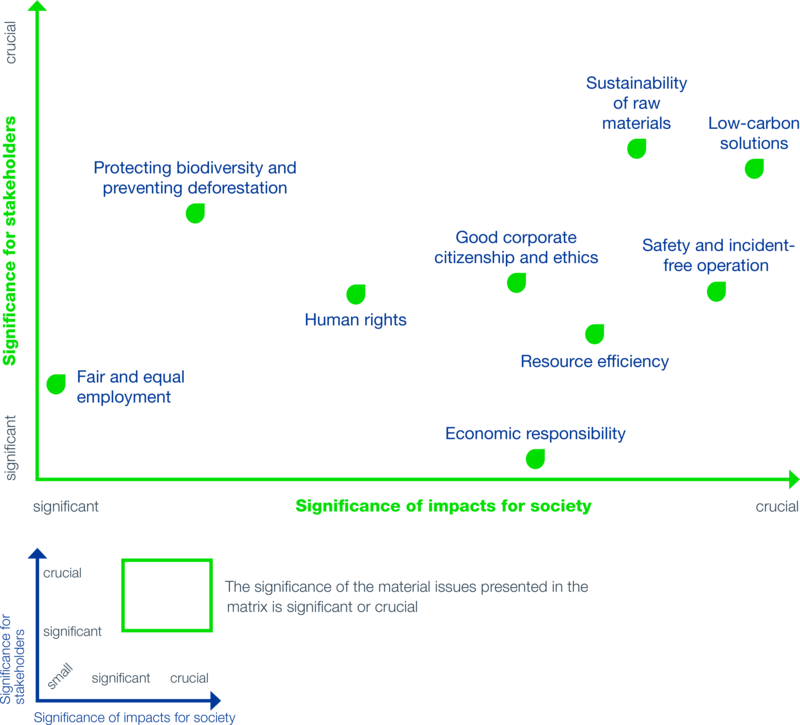 The material topics’ significance for society (x axis) was assessed in Neste’s internal workshop, where the material topics were rated by three groups consisting of experts in the environmental, social, or economic issues. Each group rated the materiality topics’ impacts for the society from its own perspective. Neste Executive Board approved the materiality matrix in May 2018. Low-carbon solutions was considered the most important topic by majority of the stakeholders. The topic ranked 1st in qualitative stakeholder interviews. Neste seems to create most value to society through offering sustainable solutions for its stakeholders with which they can mitigate climate change. Sustainable raw materials and sustainability in sourcing ranked 1st as significance for stakeholders. Neste is considered to have the greatest impact and value creation potential through its supply chain. A lot of the potential is related to replacing fossil raw materials with renewable ones. Related to sustainable raw materials, also traceability and transparency of raw materials supply was considered very important. Incident-free operation and safety of our people and society was more important for Neste’s own personnel and the local stakeholders (near Neste’s sites) than to external stakeholders in general. Good corporate citizenship and ethics ranked 4th among the most significant material topics. For Neste, being a good corporate citizen involves value creation in its operating countries by paying taxes, creating jobs, raising sustainability awareness (EduCycle), and continuous stakeholder dialogue. Biodiversity and deforestation was seen to be strongly related to value creation within the raw material supply chain. Many stakeholders considered it very important that Neste preserves biodiversity, mitigates natural resources depletion, and puts focus on land use related issues in its supply chain. Efficient use of resources was not considered very significant among the material topics. When it comes to Neste’s own operations, stakeholders thought that resource efficiency could be improved. However, it was seen that an economically viable company focuses on resource efficiency per se. Human rights was considered very important for companies’ business in general, and Neste must have a solid human rights policy in place throughout operations. However, among the most significant material topics, human rights did not rank in the top 5. Fair and equal employment ranked higher among Neste’s internal stakeholders than external stakeholders. Fair and equal employment does not have an impact on some external stakeholders’ decision making and is not the most significant from the perspective of large scale value creation. Fair and equal employment ranked 7th in the materiality assessment ahead of Economic viability. Economic viability and financial responsibility to owners was viewed as a cornerstone of a healthy company, a basic characteristic of any business. It was generally not considered very significant in the materiality assessment context. Would you like to better understand how the 9 sustainability topics presented in Neste's materiality matrix affected the content of our Sustainability Report? Our aim is to work transparently in our value chain and in continuous, close cooperation with our stakeholders.